“David Olère. The One Who Survived Crematorium III”– is a unique monographic exhibition of the works of a former Sonderkommando prisoner in the German Nazi concentration and extermination camp, which will be presented in Block 21 at the former Auschwitz I camp until March next year. 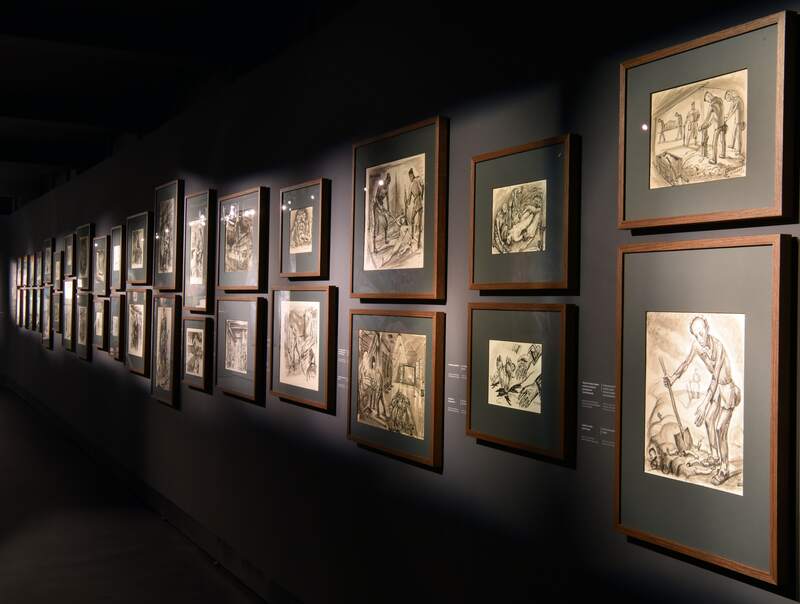 It is the largest exhibition so far, depicting the moving paintings and drawings of the artist, presenting almost the entire exceptional work related to the artist’s traumatic experiences in the camp. The exhibition displays above 80 works from the collections of Auschwitz-Birkenau State Museum, Yad Vashem and Lohamei haGetaot in Israel, as well as the Mémorial de la Shoah from France. David Olère (1902-1985), a Polish-born French Jewish painter and sculptor, was deported to the Auschwitz camp in March 1943 and assigned to the so-called Sonderkommando, a special group of prisoners, mainly Jews, who were forced to burn the bodies of those murdered in the gas chambers. The artist witnessed the death of the victims. The experience left an indelible mark on his memory. Shortly after the war, he created 70 documentary drawings, whichlater served as model for shocking oil paintings. When David Olere returned home in June 1945, “little was left of him other than his eyes”, wrote his son Alexandre. He was quite exhausted and emaciated. He was unable to eat, and unable to say what he had experienced. When he tried to tell his wife what he had seen in the Auschwitz crematoria, she was sure he had lost his mind. “He did not have the words to describe it, though he spoke five languages”. Instead he drew. He produced drawings and plans with virtually photographic precision. All his later life he devoted to giving testimony, to drawing and painting what he had experienced in Auschwitz. Shortly after the war, he produced a series of around 70 drawings, which later served as model for shocking oil paintings. Olère’s works show every stage of the horror: disembarking on the ramp, selection, death in the gas chambers and cremation of the corpses, scenes no one could have photographed or filmed. His determination to reveal every detail is today appreciated by historians, who use his sketches to help find answers to various questions concerning that particular process of mass extermination. In later years, Olère transferred particular scenes in the drawings onto canvass, creating new images filtered through his emotions. Giant, screaming images, bearing the mark of traumatic experiences. In addition, due to injuries incurred in the camp, towards the end of his life, he began to lose his eyesight. The less he could see, the larger the paintings became. His son, Alexandre, recalled: “Life was not easy in our small, modest home in a suburb of Paris. The living room, like all the other rooms in the house, was also a studio, and all the walls, up to the ceiling, were covered with designs, sketches and wet canvasses. He remained behind the barbed wire, and we, on the outside, could not reach out through that barbed wire to him”. Appearing on his paintings are those who did not survive, sometimes as the ghostly faces of witnesses observing the depicted scenes, and sometimes as the main subject of the painting. Olère also condemns the perpetrators of those events, who are often portrayed as beasts and monsters. Shocking scenes of maltreated people and defiled corpses, naked women, men and children appearing alongside their executioners, dressed in uniforms and turning into monsters, create a mixture of traditional painting with metaphysics, showing the dramatic struggle of an artist trying to give form to an inhuman subject. This type of art obviously could not be popular. People did not want to look at it, worse, they did not want to accept the fact it presented real events. Indeed, this situation contributed to the artist’s death, who was unable to come to terms with a world that denied what had happened at Auschwitz, destroying his works and boycotting his exhibitions. To this day, David Olere’s art arouses contradictory emotions. What is depicted in the paintings goes beyond human comprehension. It is easier for us to treat these paintings as the vision of an artist obsessed with the subject. Yet when we take a closer, deeper look at the canvas, analyse the particular elements, we discover in these visionary forms historical facts, the successive stages of an unprecedentedly gruesome extermination process that had been carried out in the largest German Nazi death camp: Auschwitz. On the exhibition we have unique occasion to confront with these shocking evidence, both big oil paintings and the earlier drawings. The exhibition is arranged in an unusual, atmospheric, calm way showing the work of David Olere in the context of place and history. The catalogue accompanying the exhibition, David Olère. The One Who Survived Crematorium III, includes almost all the unique works depicting the artist’s traumatic experience in the camp. Additionally, the catalogue is supplemented with historical background as well as excerpts from Sonnderkommando members’ accounts that are interpretation guidelines to help a viewer better understand exhibited works. Agnieszka Sieradzka, Art Historian & Curator, Collections, the Auschwitz-Birkenau State Museum. Agnieszka Sieradzka – art historian, graduate of the Jagiellonian University in Krakow, curator of artistic collections at the Auschwitz-Birkenau State Museum. She specializes in the subject of camp art. Author of publications and exhibitions devoted to this subject. For many years, he has been researching the illegal artistic activity of Auschwitz prisoners and the art made on order of the SS. The author: Sketchbook from Auschwitz (Auschwitz-Birkenau State Museum 2011), Lagermuseum. The camp museum in KL Auschwitz (Universitas, Krakow 2016) exhibitions and catalogs to the big exhibitions: Face to Face. 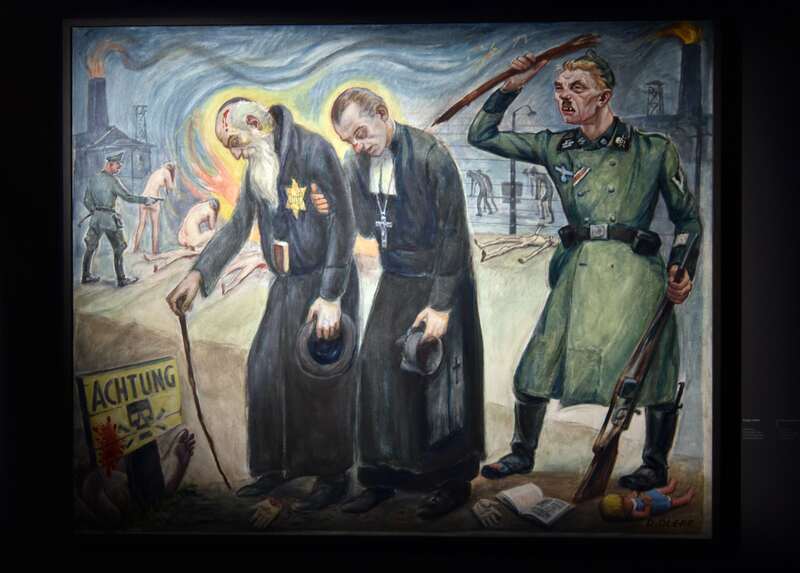 Art in Auschwitz (National Museum in Krakow), David Olère. The one who survived from Crematorium III (State Museum Auschwitz-Birkenau 2018).